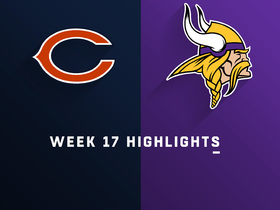 Cook rushed 11 times for 39 yards and brought in four of five targets for 21 yards in the Vikings' 24-10 loss to the Bears on Sunday. Cook rushed 16 times for 73 yards and caught all three of his targets for 35 more in Sunday's 27-9 win over the Lions. 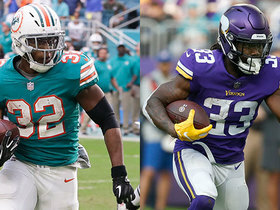 Analysis: Cook came back down to earth after blitzing the Dolphins for 136 yards on the ground and two touchdowns in Week 15, but he still served as Minnesota's primary running back, with Latavius Murray gaining just 28 scrimmage yards on 11 touches to Cook's 108 yards on 19 touches. The Vikings will ride Cook with a playoff berth on the line in Week 17, but carving out running room won't be easy against the rival Bears. Cook rushed for 136 yards and two touchdowns on 19 carries while hauling in one of two targets for 27 yards in Sunday's 41-17 win over the Dolphins. Cook rushed 13 times for 55 yards and caught five of seven targets for 28 yards and a touchdown in Monday night's 21-7 loss to the Seahawks. 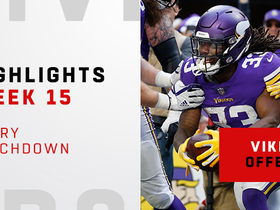 Analysis: Cook saved the Vikings from being shut out by hauling in a six-yard touchdown on the team's final offensive play. That marked Cook's second receiving TD in the past three games, but he surprisingly still hasn't found the end zone on the ground. Although Minnesota's offense was ineffective for the vast majority of Monday's contest, Cook's 13 carries were his most since Week 1, offering some hope his workload increases for this Sunday's game versus the Dolphins. Though Cook is back to full health after missing five games earlier this season due to a hamstring injury, coach Mike Zimmer was unwilling to commit to the running back reclaiming a workload on par with what he received in 2017, Chris Tomasson of the St. Paul Pioneer Press reports. "We'll see. Every game is different," Zimmer said, in response to how extensively Cook would be used Sunday against the Seahawks. "Every game is different. This team plays a lot of extra guy in the box, so we'll just have to see." Cook carried nine times for 84 yards and caught eight of 10 targets for an additional 22 yards during Sunday's 24-10 loss to the Patriots. Cook carried 10 times for 29 yards and added 47 yards and a touchdown on three receptions in Sunday's 24-17 win over Green Bay. Cook played a career-high 59 snaps in Sunday's 25-20 loss to the Bears. Cook gained just 12 yards on nine carries Sunday against the Bears. He lost two yards on his three receptions and also lost a fumble in the 25-20 loss. Analysis: Cook had no room to operate against the Bears' stout run defense, turning in a performance that would hover around the zero-point mark in almost any format. The only positive for his fantasy owners is that the dynamic back exited the contest healthy. Offensive coordinator John DeFilippo vouched for Cook's health earlier this week, so we should expect the 23-year-old to suit up in an important matchup against the Packers on Sunday. Offensive coordinator John DeFilippo said Thursday that Cook will be a "full go" in practices moving forward, Courtney Cronin of ESPN.com reports. Cook (hamstring) rushed 10 times for 89 yards and caught all four of his targets for 20 more in Sunday's 24-9 win over the Lions. Analysis: The majority of Cook's yardage came on a 70-yard run in the second quarter, but he got tackled on the five-yard line. Prior to that, Cook watched fellow running back Latavius Murray score from one yard out in the first quarter. Minnesota unsurprisingly eased Cook back in, giving both him and Murray 10 carries apiece in the second-year running back's first action since Week 4. Expect the workload distribution to skew much more heavily in Cook's favor coming out of the team's Week 10 bye. Cook (hamstring) is active for Sunday's game against the Lions. Analysis: Passing a pregame warmup was the final hurdle for Cook to get past before gaining clearance for his first action since Week 3. After missing five of his last six contests, he isn't expected to play more than 15-to-20 offensive snaps, making it difficult to forecast his carry count. Cook will otherwise yield the remaining work out of the backfield to Latavius Murray. Cook (hamstring) remains listed as questionable for Sunday's game against the Lions but appears likely to play, Andrew Krammer of the Minneapolis Star Tribune reports. Cook (hamstring) is expected to play around 15-to-20 snaps in Sunday's game against the Lions, but he'll first need to make it through pregame warmups without incident, Courtney Cronin of ESPN.com. Cook (hamstring) is listed as questionable for Sunday's game against the Lions. Cook (hamstring) is tentatively scheduled to play in Sunday's game against the Lions and handle a limited snap count, Ben Goessling of the Minneapolis Star Tribune reports. Cook (hamstring) has been limited in practice this week and "feels great," but he's unsure if he'll be able to return Sunday versus the Lions, Chris Tomasson of the St. Paul Pioneer Press reports. Cook (hamstring) was limited at Wednesday's practice. Analysis: After focusing on rehabilitation of his left hamstring for the last two weeks, Cook was a participant in practice for the first time since Oct. 17. His presence indicates a return may be possible Sunday against the Lions, but his hamstring will have to avoid the flareups that have kept him on the sideline for four games in a row and five of the past six contests. Cook (hamstring) participated in practice Wednesday, Ben Goessling of the Minneapolis Star Tribune reports. Cook, who missed his fourth consecutive game Sunday, said his hamstring is "feeling great," but he's wary of a setback, the Minneapolis Star Tribune reports. "[Rest] definitely helped me, but that's the tricky thing about these things," Cook said. "They feel good, but you go out there, overextend and do something stupid; set you back." Analysis: It's not clear if Cook will return to practice this week as the Vikings may elect to sit him out until Week 11 after Minnesota's bye. At least it sounds like he's making progress and hasn't had a setback. Cook (hamstring) has been ruled out for Sunday's game against the Saints, Nick Underhill of The New Orleans Advocate reports. Analysis: Things have been trending in this direction all week with Cook failing to practice in any capacity. Multiple reports have suggested he could be held out even longer, potentially targeting a return when the Vikings come back from a Week 9 bye. Latavius Murray will lead the Minnesota backfield in a tough matchup against New Orleans, with Mike Boone and Roc Thomas handling whatever scraps are left behind. Cook (hamstring) doesn't appear to be practicing Friday, Tom Pelissero of NFL.com reports. Analysis: Multiple reports have suggested Cook will miss at least one more game and likely two, with his failure to practice in any capacity this week making him a long shot for Sunday's game against New Orleans. Another update will be available Friday afternoon when the Vikings release their final injury report. Cook (hamstring) didn't practice Wednesday. While Cook (hamstring) hasn't officially been ruled out for Sunday's game against the Saints, it's not expected he'll play in the contest, a source tells Tom Pelissero of NFL.com. Multiple league sources believe Cook (hamstring) will sit out Sunday against the Saints and Week 9 against the Lions before potentially returning to action following the Vikings' Week 10 bye, Courtney Cronin of ESPN.com reports. Cook (hamstring) has been ruled out for Sunday's game against the Jets, Chris Tomasson of the St. Paul Pioneer Press reports. Analysis: Cook was ruled out in a game-time decision last week and won't even make it that far this time around. His full practice participation Wednesday seemed to hint at an impending return, but he was then held out both Thursday and Friday. With Cook set to miss at least one more game, Latavius Murray has another chance to lead the Minnesota backfield. Cook (hamstring) warmed up with his teammates Friday, then left the practice field before the start of the session, Andrew Krammer of the Minneapolis Star Tribune reports. Analysis: Cook did the same thing Thursday and was listed as a non-participant on the injury report. His status as a full participant Wednesday created some optimism about his outlook for the weekend, but it now appears the second-year back could be headed for another game-time decision ahead of Sunday's matchup with the Jets at 1 p.m. EDT. The Vikings will provide another update on Cook later Friday when the team releases its final injury report of the week. Cook (hamstring) didn't practice Thursday. Analysis: Cook unexpectedly departed Thursday's session early, again raising concerns about his health. During a subsequent media session, coach Mike Zimmer told Chris Tomasson of the St. Paul Pioneer Press that Cook wasn't limited Thursday, and the running back's listing as a non-participant indicates he required some treatment on his hamstring, at the very least. With this downgrade, Cook's status will be of keen interest as he prepares to gain clearance to play for just the second time since Week 2. Cook (hamstring) was not limited in practice Thursday, head coach Mike Zimmer told Chris Tomasson of the St. Paul Pioneer Press. Analysis: Cook left practice during the period open to reporters, but apparently it wasn't due to a setback to his hamstring injury. By participating in two full days of practice, it increasingly looks like he could return this week against the Jets after missing three of the last four games. Cook left the portion of Thursday's practice open to the media, Chris Tomasson of the St. Paul Pioneer Press reports. Analysis: Cook put in a full session Wednesday, putting himself in line for just his second appearance since Week 2. His early departure Thursday is somewhat worrisome, but the reason won't be confirmed until the Vikings release their injury report and/or coach Mike Zimmer holds a media session. Cook (hamstring) was a full participant in practice Wednesday, Adam Caplan of SiriusXM Radio reports. 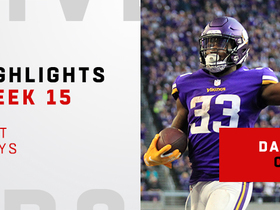 Analysis: Although he's missed three of the Vikings' last four games due to a hamstring injury, Cook apparently was "close" to suiting up in last Sunday's eventual win over the Cardinals. Ultimately, the call to hold out Cook came during pregame warmups. With an uncapped practice under his belt, Cook seems to be past the issue and will now prepare in earnest for a Week 7 matchup with the Jets' 17th-ranked run defense (108.7 yards allowed per game). Coach Mike Zimmer said Cook (hamstring) was "close" to playing Sunday against the Cardinals, but "we just have to feel comfortable with it," Andrew Krammer of the Minneapolis Star Tribune reports. Analysis: Cook's availability Sunday came down to a pregame workout, but his hamstring didn't react well to the increased activity, and the Vikings opted to hold him out for the third time in four games. Per usual, his activity level will be monitored closely in the coming days as the Vikings prepare for a Week 7 visit to the Jets. Look for Latavius Murray to lead the backfield in the event Cook is sidelined again. Cook (hamstring) is inactive for Sunday's game against the Cardinals, Adam Schefter of ESPN reports. Analysis: Although Cook was expected to return, his hamstring didn't react well to a pregame warmup. As such, Latavius Murray should handle the bulk of the running back workload Sunday, though Mike Boone and Roc Thomas could also get in on the act. The Vikings plan on Cook (hamstring) playing Sunday against the Cardinals, but he'll likely be limited to around 20-to-25 offensive snaps, Ben Goessling of the Minneapolis Star Tribune reports. Cook (hamstring) scaled back to limited participation at Friday's practice and is listed as questionable for Sunday's game against the Cardinals, Chris Corso of the Vikings' official website reports. Cook (hamstring) was a full practice participant Thursday, Field Yates of ESPN reports. Cook (hamstring) was limited at practice Wednesday. Cook (hamstring) took handoffs from quarterback Kirk Cousins during the open part of practice Wednesday, Andrew Krammer of the Minneapolis Star Tribune reports. Analysis: Cook mostly was contained to rehab work last week, logging just one limited practice session Friday. Subsequently termed a game-time decision, Cook was on the Vikings' inactive list Sunday at Philadelphia. With a likely appearance at Wednesday's practice, Cook appears to be trending in the right direction, but the health of his hamstring will dictate whether a return is possible Week 6 against the Cardinals. Cook (hamstring) is inactive for Sunday's Week 5 tilt against the Eagles. Analysis: As expected, the second-year running back takes a seat for Sunday's conference showdown with the world champions. Latavius Murray projects to helm the Vikings backfield, while Mike Boone and Roc Thomas are around to serve as his backups. Ben Goessling of the Minneapolis Star Tribune reports that Cook (hamstring) will not play Sunday against the Eagles. Analysis: A final call on Cook's Week 5 availability will not be made until Sunday afternoon, but it was reported Saturday that he was not expected to play, and this more recent report moves the needle closer to him being inactive. Minnesota is not expecting Cook (hamstring) to play Sunday as he would need an impressive turnaround to be on the field, Ian Rapoport of NFL Network reports. Analysis: He hasn't officially been ruled out and will likely test his hamstring in pre-game workouts. Still, this report seems to confirm the trend Cook saw in practice all week where he was limited and appeared trending toward not playing or having a limited role. It looks like Latavius Murray will be set for the bulk of playing time Sunday against the Eagles. 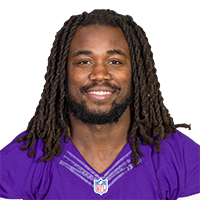 Cook (hamstring) was a limited practice participant Friday and is listed as questionable for Sunday's game in Philadelphia, Chris Corso of the Vikings' official website reports. Cook (hamstring) was limited to rehab work at Friday's practice, Andrew Krammer of the Minneapolis Star Tribune reports. Analysis: It's unclear if Cook will be listed as a non-participant or a limited participant, but he's expected to get a "questionable" designation either way, with his status for Sunday's game against the Eagles potentially coming down to a game-time decision. Another update will be available later Friday when the Vikings release their final injury report of the week. Cook (hamstring) was a non-participant at Thursday's practice. Cook (hamstring) didn't participate at practice Wednesday. Analysis: Following an admission Monday that his left hamstring isn't 100 percent, Cook proceeded to work out with the Vikings' strength coach on a side field during Wednesday's session. The team seemingly will take a wait-and-see approach with the running back, who could be on a "pitch count" again Sunday at Philadelphia, assuming he's active. In his return from a one-game absence last Thursday against the Rams, Cook earned 10 carries on his 20 offensive snaps, turning them into 20 yards. Cook (hamstring) was seen working on a side field at the beginning of Wednesday's practice, Andrew Krammer of the Minneapolis Star Tribune reports. Analysis: The Vikings were deliberate with Cook in his return from a one-game absence last Thursday against the Rams, running him 10 times on his 18 offensive snaps. Cook netted a career-low 20 yards on those touches and also wasn't targeted for the first time in seven professional games. While Cook worked out with the team's strength coach, it remains to be seen if he'll participate in either individual or team drills Wednesday. Cook acknowledged Monday that he isn't yet 100 percent recovered from the hamstring injury he sustained Week 2 against the Packers and said he was uncertain if he would be on a "pitch count" Week 5 versus the Eagles, Arif Hasan of The Athletic reports. Cook (hamstring) rushed 10 times for 20 yards in the Vikings' 38-31 loss to the Rams on Thursday night. Analysis: Cook was back in uniform after missing the team's Week 3 loss to the Bills, but as had been the case in the other two games he played this season, he found precious little running room. The 23-year-old has now averaged under 3.0 yards per carry in two of the three contests he's suited up for, although he's partly made up for that lackluster production with nine receptions for 107 yards. He'll look to find some success on the ground against the Eagles in Week 5. Cook (hamstring) is active for Thursday's game at the Rams. Analysis: Cook's availability seemingly was tied to his left hamstring holding up during a pregame warmup. Unlike practice this week, he didn't have a sleeve on that leg, but he'll almost certainly have some type of support on the region for this Week 4 showdown. His workload is the biggest question mark at this point. Ian Rapoport of NFL Network reported that Cook will be on a "pitch count," which means some type of split with fellow running back Latavius Murray should ensue. Cook (hamstring) is expected to suit up for Thursday's road game against the Rams, Ian Rapoport of NFL Network reports. Analysis: As Adam Schefter of ESPN reported earlier Thursday, the Vikings will keep a close eye on Cook during pregame warmups to ensure he can handle the rigors of game action after missing one contest with a hamstring injury. Assuming Cook suits up, he'll be on a "pitch count," per Rapoport, which implies Latavius Murray will remain a useful option in the Vikings offense. According to Adam Schefter of ESPN, Minnesota is optimistic that Cook (hamstring) will suit up Thursday against the Rams, despite his "questionable" designation. Cook (hamstring) is listed as questionable for Thursday's game against the Rams, Chris Tomasson of the St. Paul Pioneer Press reports. Cook (hamstring) was a limited participant in Tuesday's practice. Vikings head coach Mike Zimmer said that "there's a possibility" Cook (hamstring) will play Thursday against the Rams, Tom Pelissero of NFL.com reports. Cook (hamstring) was listed as a non-participant on Monday's injury report. Analysis: The Vikings exercised caution with their starting running back, holding him out Sunday with the schedule presenting two games in five days. According to Ben Goessling of the Minneapolis Star Tribune, Cook himself expects to suit up for Thursday's road game against the Rams. However, an appearance or two at practice this week would provide a semblance of confidence in his ability to do so. Cook (hamstring) reiterated Monday that he expects to play in Thursday's game against the Rams, Ben Goessling of the Minneapolis Star Tribune reports. Analysis: Cook said his hamstring is feeling good, though he also acknowledged he'll need to operate on a day-to-day basis to see how the injury responds. He didn't practice at all last week and was ruled out on the Friday injury report ahead of Sunday's 27-6 loss to the Bills. A return to limited participation Monday or Tuesday would be an excellent sign for his Week 4 availability. Cook (hamstring) said he definitely will return for Thursday's game against the Rams in Week 4, Chris Tomasson of the St. Paul Pioneer Press reports. Analysis: This needs to be taken with a grain of salt given that Cook has already been ruled out for Sunday's game against the Bills. He may only be dealing with a minor injury, but the short time between games is nonetheless problematic. Latavius Murray will handle the lead role Sunday, with Mike Boone and Roc Thomas coming off the bench. Cook (hamstring) has been ruled out for Sunday's game against the Bills. Analysis: Latavius Murray will take over as the lead back, with undrafted rookies Mike Boone and Roc Thomas providing depth. Cook is in clear danger of missing multiple games, as the Vikings will face the Rams on Thursday Night Football in Week 4. He was held out of practice Wednesday and Thursday, then limited to side work with the training staff during the portion of Friday's session open to the media. Cook (hamstring) worked off to the side during the portion of Friday's practice open to the media, Andrew Krammer of the Minneapolis Star Tribune reports. Analysis: Listed as DNP the previous two days, Cook will be no better than a limited participant in the final practice before Sunday's game against the Bills. Another update will be available Friday afternoon when the Vikings release their final injury report of the week. Cook (hamstring) worked out on a side field during the part of Thursday's practice open to the media, Courtney Cronin of ESPN.com reports. Analysis: Cook left the overtime period of Sunday's tie in Green Bay with what was later termed "cramping," but a DNP at Wednesday's practice was accompanied by a hamstring tag. The severity of the injury is unknown, but it appears he's focusing on rehab rather than on-field work so far this week. Behind Cook, Latavius Murray is waiting in the wings in case any reps become available. Cook (hamstring) didn't participate in Wednesday's practice. Cook classified the hamstring injury he sustained in overtime Sunday in the Vikings' 29-29 tie with the Packers as a cramp, Tom Pelissero of NFL.com reports. Analysis: It sounds like Cook merely fell victim to the high temperatures at Lambeau Field rather than any sort of injury, so there shouldn't be much concern about the running back's status heading into the Vikings' Week 3 matchup with the Bills. Prior to departing, Cook saw a reduction in volume compared to his Week 1 workload, which was largely a byproduct of the Vikings trailing for most of the day. He finished the contest with 38 yards on 10 carries and added three receptions for 52 yards. Cook downplayed the hamstring issue he dealt with Sunday, Andrew Krammer of the Minneapolis Star Tribune reports. "Just fatigue," Cook noted with the regard to the reason for his exit from Sunday's tie with the Packers. "It was hot out there." Analysis: The running back's status will still be worth monitoring in the coming days, but with his injury not related to last year's season-ending knee issue and seemingly minor, it looks like those invested in Cook have caught a break. The Vikings take on the Bills at home next Sunday. Cook is questionable to return to Sunday's game at Green Bay due to a hamstring injury. Analysis: Cook got crunched on a tackle during overtime and remained on the ground for a spell before walking to the sideline under his own power. If he's unable to return, he'll finish the game with 90 yards from scrimmage on 13 touches. Latavius Murray will be the preferred running back option in Cook's stead. Cook played 57 of 71 snaps (80.3 percent) on offense in Sunday's 24-16 win over the 49ers. 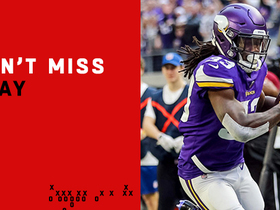 Cook rushed 16 times for 40 yards and brought in six of seven targets for 55 yards in the Vikings' 24-16 win over the 49ers on Sunday. He also lost a fumble. Vikings head coach Mike Zimmer said that Cook won't be held to a "pitch count" in terms of total snaps in the season opener Sunday against the 49ers, but the running back will be watched closely by the team throughout the contest, Dianna Russini of ESPN reports. Vikings offensive coordinator John DeFilippo said there's no set plan for Cook's workload on Sunday. "We're not sure yet. We're going to see how it goes. There's nothing that hasn't told us that he can't carry the load," DeFilippo told Courtney Cronin of ESPN. Analysis: Cook has only two carries (both in preseason Week 3) since tearing the ACL in his left knee Week 4 of last season. While head coach Mike Zimmer has praised Cook and said he's back to full strength, it's not clear if Cook will be eased into action Sunday. DeFilippo's comments could be read either way in that Cook isn't on a limited play count, but not guaranteed a large workload either. Vikings head coach Mike Zimmer believes Cook's "foot quickness" and "acceleration" have returned to normal, Matt Barrows of The Athletic reports. Cook rushed twice for one yard during Friday's preseason game against the Seahawks. He was also targeted once but did not record a reception. Cook will suit up for Friday's preseason game against the Seahawks, Chris Tomasson of the St. Paul Pioneer Press reports. Analysis: In his return from a torn ACL, Cook isn't expected to play more than one possession, per Tom Pelissero of NFL.com. In essence, Cook is getting some live hits before the regular season, thus alleviating concerns that he can be a workhorse running back in 2018. Cook (knee) has increased preparation for Friday's preseason game against the Seahawks, Jon Krawczynski reports. Cook (knee) will not dress for the Vikings' exhibition matchup with the Jaguars on Saturday, Tom Pelissero of NFL.com reports. Though Cook (knee) doesn't know if he'll play in Saturday's preseason game against the Jaguars, he noted that he'll be ready for Week 1 even if he doesn't see any exhibition action, Chris Tomasson of the St. Paul Pioneer Press reports. "My knee is ready to go," Cook relayed Thursday. "I'm ready to play.'" Vikings head coach Mike Zimmer said he doesn't know if Cook (knee) will play in Saturday's preseason game against Jacksonville, Chris Tomasson of the St. Paul Pioneer Press reports. Cook (knee) went through a scripted pre-game workout but will not play in Saturday's preseason opener against the Broncos, Chris Tomasson of the St. Paul Pioneer Press reports. Analysis: There was speculation that Cook could play Saturday in what would mark the running back's first live snaps since he tore his ACL in Week 4 of last year. However, it looks like Cook will now have to wait another week. 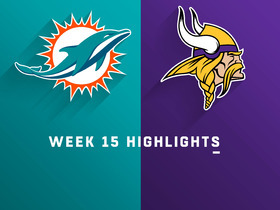 The Vikings' second preseason game is next Saturday against the Jaguars. Cook (knee) may play in Saturday's preseason game at Denver, Chris Tomasson of the St. Paul Pioneer Press reports. Analysis: Previously, it was the running back himself that was "hopeful" of a preseason appearance, which was substantiated by coach Mike Zimmer, per Andrew Krammer of the Minneapolis Star Tribune. Now, it appears Cook has a real shot to suit up a little more than 10 months removed from a torn left ACL. Even so, Cook is unlikely to see more than a series or two per game until the regular season. Cook (knee) hopes to play in the preseason but isn't sure if the Vikings will let him, Andrew Krammer of the Minneapolis Star Tribune reports. Analysis: Now 10 months removed from tearing the ACL in his left knee, Cook has been a full participant early in training camp, with his workload including full-team contact drills. He's clearly on the right track for Week 1, and Vikings coach Mike Zimmer confirmed Cook will play at some point during the preseason, per Krammer. Cook (knee) will participate Monday in the Vikings' first session of training camp with pads, Courtney Cronin of ESPN.com reports. Analysis: While the team is easing him back into action with limited reps, Cook hasn't been wearing a knee brace and doesn't seem to have any restrictions in terms of what type of work he's allowed to do. Wednesday will mark exactly 10 months since he suffered a torn ACL in Week 4 against the Lions. Cook (knee) wasn't a "full-go" at the first practice of Vikings training camp Thursday, Andrew Krammer of the Minneapolis Star Tribune reports. Analysis: Prior to drills, offensive coordinator John DeFilippo told Chris Tomasson of the St. Paul Pioneer Press that Cook would be a full participant, but the team appears to be easing him back into the swing of things. The approach is a prudent one considering Cook sustained a torn ACL in his left knee a little less than 10 months ago. On a positive note, he's entering camp without a knee brace, so it's only a matter of time before contact is introduced to his regimen. Offensive coordinator John DeFilippo relayed that Cook (knee) will be able to work fully in training camp, Chris Tomasson of the St. Paul Pioneer Press reports. Cook didn't have a brace on his surgically repaired left knee at Wednesday's walk-through practice, Andrew Krammer of the Minneapolis Star Tribune reports. Analysis: Cook has consistently surpassed expectations in his rehab from a torn ACL, even participating in team drills during June minicamp. He seems to be headed for a relatively normal training camp and preseason, less than 10 months removed from the initial injury. Cook offers clear three-down workhorse potential, but the Vikings are still likely to keep Latavius Murray involved in some capacity. Cook (ACL) participated in team drills Tuesday, Andrew Krammer of the Minneapolis Star Tribune reports. Analysis: Cook's return to team drills Tuesday marks a big step in his recovery after he initially only worked in individual drills during OTAs. He's expected to be ready to contribute by the time training camp rolls around, and Tuesday's progression certainly puts him on that path. Assuming Cook returns to full speed to begin the 2018 campaign, he should lead the Vikings' backfield again, with Latavius Murray serving in an ancillary role. Cook (knee) went through individual drills on the rehab field during Wednesday's practice, Courtney Cronin of ESPN.com reports. "I think he'll probably get some work [during OTAs and minicamp] and then should be ready to roll for training camp," Vikings head coach Mike Zimmer said. Vikings coach Mike Zimmer said Sunday that Cook (knee) remains ahead of schedule, noting that the running back likely will get some work in OTAs this week but still figures to have limitations until training camp, Tom Pelissero of NFL.com reports. Cook (knee) has been doing some work on the field during the Vikings' voluntary offseason program, Chris Tomasson of the St. Paul Pioneer Press reports. "Really, Dalvin's knocked the rehab out of the park," Vikings athletic trainer Eric Sugarman said. "He's done a great job. He's been here every day since the injury occurred post-surgery. He'll participate in [Organized Team Activities and minicamp] on a limited basis. Then the plan is for him, hopefully when he gets to training camp he'll be a participant just like everybody else." Cook (knee) will be a limited participant in spring drills but is expected to be a full participant in training camp, Chris Tomasson of the St. Paul Pioneer Press reports. Cook (knee) is ahead of schedule in his rehab and is expected to be a partial participant at Organized Team Activities in May, Brian Murphy of The St. Paul Pioneer Press reports. Vikings head coach Mike Zimmer said Thursday that Cook (knee) is going to be "pretty close" to being ready for Organized Team Activities in the spring, Tom Pelissero of NFL.com reports. Cook (knee) said Monday that he has started jogging but remains without a firm timetable to return to full football activities, Kevin Seifert of ESPN.com reports. Cook (knee) began walking without the assistance of crutches last week, Chris Tomasson of the St. Paul Pioneer Press reports. Analysis: Cook is still in the early stages of his recovery from Oct. 10 surgery to address a torn ACL in his left knee, so while he's ready to begin weight-bearing activities, it could be several months before he's cleared to run at full speed. That being said, with no setbacks in his recovery to date, Cook is tentatively on track to be fully healthy by the time the 2018 regular season commences. Minnesota Vikings wide receiver Stefon Diggs and running back Dalvin Cook join "Inside Training Camp" and discuss the upcoming season. 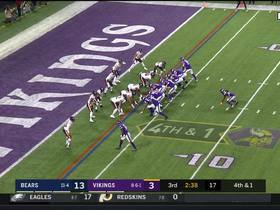 Minnesota Vikings running back Dalvin Cook extends the drive with a 2-yard run on fourth down. 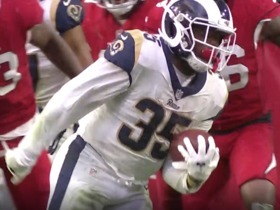 Take a look at the best runs from Week 16 around the NFL. 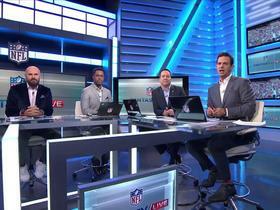 NFL Network's "NFL Fantasy live" crew reveals what they learned from Week 15 around the league. Minnesota Vikings running back Dalvin Cook manages to strategically spin his way through the Miami Dolphin's defense for an impressive 21-yard touchdown. Minnesota Vikings running back Dalvin Cook had 19 carries, 136 yards and 2 touchdowns in Week 15 against the Miami Dolphins.